This guy knows how to make a costume on a budget. Can’t wait to see his Slave Leia costume made from Twist Ties and used garbage bags he found behind the Beef Baron . 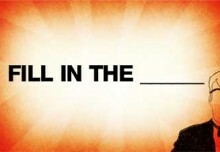 Fill In The Blank – One Thing’s For Sure Now…No One Can Ever Go Home Again. Never. How Many of These Characters Do You Know?